Larry Sherry began life with two strikes against him: He was born with clubfeet. His mother had taken a fall during her pregnancy and family members think that was the cause. But who knows? He had severe trouble walking until he was about twelve years old. After a series of operations and being outfitted with special shoes that he has worn throughout his life Larry went on to overcome this disability and become a major league baseball player. His brothers before him were all good athletes. All three had played baseball for their high school team. Larry was determined to follow in their footsteps. But first he had to have the operations and wear the corrective shoes. When he did he not only would follow in their footsteps as a star athlete at Fairfax High but created his own footnote — and more — when he starred in the 1959 World Series. At Fairfax High in Los Angeles, Larry was also a star basketball player. He captained the basketball squad and set a record at the school by scoring 22 points in a game. Larry Sherry dazzled the baseball world in 1959, when he pitched the Dodgers into the World Series against the Chicago White Sox and then proceeded to shut down the Sox in the Series to give the Dodgers the baseball title. For his efforts he was awarded a car by Sport magazine, the Baseball Award at the Los Angeles Times Dinner and was wined and dined by the New York Baseball Writers when they presented Larry with the Babe Ruth Award. Quite a feat by a man born with deformed feet. It wasn't easy getting to the big leagues for Sherry. He struggled in the minor leagues until he came up with a slider. Then in the middle of the 1959 season he was called up to the Los Angeles Dodgers and zoomed to meteoric heights by helping them win the National League pennant and winning two games and saving two more in the World Series against the Chicago White Sox. Sherry pitched 12-2/3 innings, giving up one run and eight hits in the Series. For the first time in World Series history neither team had a starting pitcher completing a game A most unlikely hero, Sherry astounded the baseball world with his heroics. Larry Sherry was born in Los Angeles, California, on July 25, 1935. With both feet malformed he underwent operations at the age of 6 months to correct the deformity. He was in awe of his three older brothers — Stan, Norm and George — all of whom became star athletes at Fairfax High. The Dodgers signed him to a contract as soon as he finished high school and assigned him to their farm team in Santa Barbara. Showing the promise that was to come much later, he pitched a shutout against Bakersfield. But Larry was only 18 and was rarely used, winding up the season with a 1-2 record. The next year he was with Bakersfield and Great Falls with a combined 7-8 record. It was a tough road for Sherry; he admitted he had a lot to learn. At Newport News in the Piedmont League he wound up with a 5-10 record. It looked as if he would spend the rest of his baseball days in the minors. In 1956 Sherry was sent to the Class A Pueblo Dodgers in the Western League where he won 13 and lost 13. But he was getting better and had hopes of soon making it to the majors. At Pueblo he met Sally Swearingen and married her on December 27 of that year. The 1957 season found Larry grinding away in Fort Worth with 48 strikeouts and a 10-10 record. In 1958, Sherry was up with the Dodgers, but Sherry was wild and ineffective. Sent down to Spokane, he won 6 and lost 14. To the rescue came big brother Norm Sherry. Over the winter of 1958 Larry worked with Norm and developed a slider. Pitching in Maricaibo in the Cuban League he used his new-found slider and did well. For the first time he felt he was ready for the big leagues. In 1959 he was with Saint Paul using his fastball and slider to good advantage. On Independence Day of 1959, the Dodgers called up Sherry. Larry started out with the Dodgers by losing two one-run decisions. But the best was yet to come. He won seven games in a row and was credited with three saves. Hurling 94 innings, he gave up only 75 hits, walked 43, and struck out 72. He appeared in relief 14 times, pitching 36-1/3 innings with an amazing earned run average of 0.74. Sherry then topped it all off by his sensational performance in the World Series against the Chicago White Sox. Larry owed much to Norm. 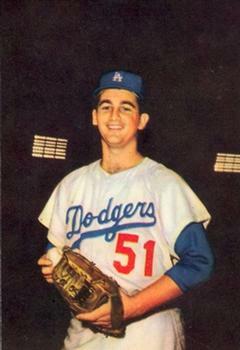 Norm Sherry also helped Sandy Koufax, who later became one of the great pitchers in the history of baseball. In fact, the three were close buddies and would go out on the town together. One time in Philadelphia, Sandy wanted to go to a Chinese restaurant so they hopped into a cab and went to a restaurant, but Sandy said no to eating at this restaurant. Three more restaurants were visited before Koufax said OK. Larry Sherry asked Koufax, "What's the big difference?" Sandy replied. "If you go to a Chinese restaurant it has to have an awning. This one has an awning so it must be good." The two Sherry brothers from Southern California looked at each other, not comprehending that Sandy, a New Yorker, always looked for Chinese restaurants with awnings for that was what all Chinese restaurants in New York had. On May 7,1960, Larry and his brother Norm were batterymates. The Sherry brothers became the first and only Jewish brother battery in major league history. In 1961, manager Walt Alston fined both Sherry and Koufax for breaking the curfew at the Dodgers' spring training camp in Vero Beach, Florida. Alston caught the two coming in at 1:45 a.m. Sherry ran to his room and locked the door, but the usually mild-mannered Alston pounded so hard on the door that Larry finally opened it up and took his punishment. Alston had hammered so hard on the door that he broke the diamond-studded ring he was wearing. The two culprits said they had made a pizza run to Port St. Lucie and misjudged the time. Sherry stayed with the Dodgers through the 1963 season and then was sold to Detroit in 1964. Sherry was with the Tigers until partway through the 1967 season when he was traded to Houston. 1968 was his last year as a major leaguer with the California Angels. Sherry's 11 years in the majors resulted in 53 wins and 44 losses, with a respectable earned run average of 3.67. Sherry was not finished with baseball. He was the pitching coach for the Seattle Rainiers in the Pacific Coast League for the rest of the 1968 season having been released on July 7, 1968, by the Angels. He returned to the majors as a pitching coach during the 1977 and 1978 seasons with the Pittsburgh Pirates. From 1979 to 1980 Sherry was a coach with the California Angels. If it were not for his memorable 1959 season, Larry Sherry would probably be known only as a journeyman relief pitcher. But for one shining moment he lit up the baseball world with an astounding performance during the 1959 season and the World Series. A quote in the Talmud from Judah Hanasi describes Larry's baseball career. "Some win eternity after years of toil, others in a moment." Larry Sherry did both; after years of toil in the minors he made it to the show and in the 1959 season in a moment of brilliance he etched his name in baseball history. An avid golfer, Larry lived with his wife in Mission Viejo, California for many years after retirement. They were the proud parents of a son, Scott, and a daughter, Suzanne. Larry Sherry died on December 17, 2006, after a long battle with cancer. He was 71. Nemec, David and Wisnia, Saul. 150 Years of Baseball. Lincolnwood, Illinois: Publications International, 1997. Ribalow, Harold U., and Ribalow Meir Z. Jewish Baseball Stars. New York: Hippocrine Books, 1984.